Growing up in a house where reading ruled supreme, finding time to squeeze in the all-American activity of TV watching could be a bit of a challenge. My parents did not hate TV so much as see it as a useless but inevitable part of life to be strictly managed—like a unibrow, but more seductive. Accordingly, I was granted a small allowance of TV time weekly—pitifully small to my greedy eyes. Presumably because of its educational bent, the one channel that escaped such strictures was PBS, and a daily show or two after school became a treasured ritual of my childhood. To a nerdy boy with a long burning obsession with dinosaurs and, to a lesser extent, things like space and biology, by far the best show on the network was Bill Nye The Science Guy. The show tackled just about every science topic imaginable to a kid, from food and digestion to planets and energy. Better yet, the show burst with its own energy, most of it radiating from its center, the bow-tie-sporting, eyebrow-wiggling science guy himself. Nye always came across as a fun uncle, someone with no responsibilities and plenty of ideas. This particular fun uncle, of course, came equipped with a lab full of explosive chemicals, which he was not afraid to mix with reckless abandon. Bill Nye the actual person possesses a combination of skill sets that makes him uniquely adapted for the role of science educator. Trained as an engineer, he has the chops necessary to tackle science credibly. He also spent a number of years as part of a sketch comedy troupe in Seattle, meaning he has a knack for the structure and timing of entertainment. 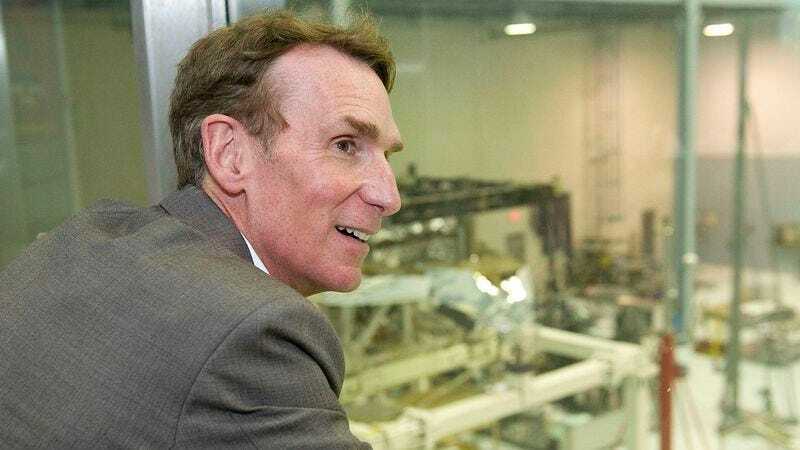 Ultimately, though, it is his incandescent, often manic energy that transforms him from Bill Nye, regular guy, into Bill Nye The Science Guy, a being perfectly suited to reach children with the wonders of science. Returning to the show after many years, I was pleased to discover that this energy still holds the show together and makes it fun to watch even as an grown up. Not all the jokes work, and the science inevitably feels simplistic from the vantage point of adulthood, but Nye remains a magnetic figure, and the show retains a vitality that keeps the viewer engaged throughout. This energy comes across at the beginning of every episode in the part of the show most viewers remember best: its earworm of a theme song. Here, in a microcosm, is the show. An upbeat tune accompanies the simplest of lyrics (literally just Bill’s name and title over and over again). In the background random phrases about science are said (“Inertia is a property of matter”). Meanwhile, the images on screen come fast and furious, a collage of seemingly unconnected snippets meant to evoke science in an abstract form. Bill’s head pops in and out, and he dances frantically along to the music. The total effect is one of sensory overload: The song doesn’t just have bells and whistles, it is bells and whistles—all the way down. That’s true of the show as a whole, which plays out with the mental curlicues of a sugar-addled brain. After introducing a topic, each episode unspools via a series of unconnected sketches, experiments, and “in the field” segments. There are a few segments that pop up in most episodes—“Consider The Following,” “Way Cool Scientist,” and the music video parodies that end each episode—but they do not seem to follow any sort of pattern. An actual experiment will get placed next to a ’50s movie parody, and a serious point about science will get immediately undercut by absurd video editing. The only method amid the madness appears to be a consistent application of maximalism. In this the show bears an eerily prescient resemblance to the internet videos of today; indeed, far from feeling dated, the show’s aesthetics seem like a better fit in the present moment than they would have been during the original run of the series in the mid-’90s. The frantic pace means that the show’s humor tends toward the kitchen sink variety. Given Nye’s background as a sketch comedian, it makes sense that he would favor a goofy, go-for-broke style where jokes and oddities hit the screen at a speedy clip, but with a high ratio of misses to hits. Since the show targeted children, it traded quite a bit in the sort of randomness that tends to amuse kids more than adults. Some of these gags work; I was amused, in the episode on chemical reactions, by the series of increasingly more grandiose explosions over which the show’s announcer intones in glorious deadpan, “And now for another really big chemical reaction.” But others don’t, and the total effect can be a bit deadening. Another childish aspect of the humor works a bit better: the gross-out gags. Never afraid to do something strange and off-putting (for the sake of science, of course), Nye anticipates shows like Fear Factor in his willingness to push the boundaries of good taste, though to a much milder degree. In the episode on digestion, he demonstrates the workings of the human digestive system by mixing together a cheeseburger, fries, and a shake in a model of a human digestive tract. After mashing the foods together in imitation of the work of stomach muscles, he takes a satisfied sip of the concoction, in a shot that had me feeling queasy. Despite the majority of the jokes being aimed at children, the show actually does have quite a bit of content designed to go over the heads of little ones and reach the parents. There’s not much resembling “adult” humor on hand, but there’s a penchant for references that children could not possibly get (as in the cameo by the trio of jugglers who named themselves after the siblings in The Brothers Karamazov) and off-hand remarks (like a quick reference to ulcers, with the child actor telling the kids at home to ask their parents for more information about that subject). The show also has a fondness for parody and tends to focus on eras too bygone to be recognizable to the average ’90s kid. Many episodes feature themed parodies that evoke film noir or drive-in horror films, with stylistic touches that mean much more to me now than they ever could have when I was younger. The show also has a love for recurring gags and meta-commentary. Often, in what should be the middle of a segment, the show will cut from the scene itself to a black and white picture of a “perfect” suburban family—mother, father, and daughter—who look ripped out of a TV ad from the ’50s, as they observe the antics of Bill and his associates, apparently unmoved by the buffoonery on screen. Another recurring character, Richie, who with his family calls to mind the Cleavers, refuses to eat anything but Wonder Bread and steadfastly munches away as he watches the show, as if through a time warp. Sometimes the show pushes its odd humor to surreal levels. This is certainly true in the case of Vivian Cupcake (played by Nye dressed as a woman), an oddly aggressive TV chef who demonstrates food chemistry and whose persona splits the difference between Julia Child and Mrs. Doubtfire. It’s also true of the occasional cameos by celebrities, a stable that includes Sinbad, the ne plus ultra of ’90s minor celebrity cameos. My favorite features Bill talking about the food web with Alfonso Ribeiro, a scene which devolves into the two of them eating carrots while the camera glitches like a strobe light. In its calculated strangeness, the scene feels like a forerunner to, among other things, the infamous “cool beans” scene from the Lonely Island film Hot Rod. If Bill Nye The Science Guy’s humor is diverse and diffuse, its approach to science comes across as relatively focused. Whatever the theme of the episode, each one tends to narrow in on a few easily memorized facts that children can take away. Thus, in the episode about the Earth’s crust, Bill repeatedly mentions talking points like the thinness of the crust, its necessity in sustaining life above a molten core, and the existence of phenomena like volcanoes and earthquakes, which arise from irregular activity along the earth’s surface. This set of facts gets recycled throughout the episode, with Bill or the announcer repeating them verbatim at various points. Presumably this method has the aim of getting children to walk away with a manageable set of facts that they can remember and repeat. This means that the show probably won’t fill in too many gaps in the knowledge of adult viewers, no matter how many factoids one may have forgotten from middle school science class. That’s not really a problem—the show is intended for kids, after all—but the sound-bite approach to science, paired with the rapid-fire feel of the show, make for an environment that feels a bit too shallow at times, even for the science kiddie pool. The show’s regular segments, especially “Consider The Following” and “Way Cool Scientist,” illustrate this lack of depth. “Consider The Following” presents itself as one of the more serious sections of the show, with Bill providing a point to ponder for the audience. Instead of using this time to dive deeper, however, the show mostly contents itself with a slight repackaging of information already given, with just the slightest hint of elaboration thrown in. “Way Cool Scientist,” meanwhile, puts a real, on-the-job scientist in the spotlight to show kids how science actually happens. Again, though, the time spent on the segment (usually less than a minute) and the facile nature of the presentation mean that the audience gets only the briefest description of what each scientist does, barely getting to witness them in action. The segment is a real lost opportunity for a show that clearly wants to go beyond talking about science to kids and actually model scientific practice. This shallow approach even extends to the show’s experiments. Although the idea is that kids will duplicate them at home, and thus develop a love for science, the actual experiments are often lackluster. Close to three quarters of the home experiments I saw over six episodes featured some variation on mixing baking soda and vinegar, that old standby trick of the lazy science fair student. Obviously kids could not duplicate the more dangerous and exotic experiments the show performs, but those on display for imitation could use more imagination. Still, despite the show’s limitations, Bill Nye The Science Guy succeeds in its biggest goal: to make science seem cool. Many smaller elements help sell this feeling, such as the surprisingly high quality of the enthusiastic child actors. That’s key for a show about the wonders science holds for children: seeing other kids involved and engaged helps children at home envision science as an adventure to be undertaken. Primarily, though, the show’s success in selling science rests on Nye’s shoulders, a task he measures up to admirably. It’s not just that he has a charismatic screen presence or that his energy meshes perfectly with the breakneck pace of the show. He models for kids the relentless curiosity that is supposed to be a hallmark of the scientific mind. That’s a powerful enough force to awaken the scientific spirit even in someone like me, whose early scientific fervor has gradually dissipated as other interests have taken over. Rewatching Bill Nye The Science Guy hasn’t led me to consider a career change, but it has reminded me of the spark of enthusiasm I once had for science, a spark that the show itself helped maintain throughout my childhood.